I really wished I had better hearing protection when this Tweety Bird fired up and taxied out for a flight demonstration during the 2007 Aviation Nation airshow. The piercing whistle quickly gave the T-37 its name “Tweety Bird”, or just “Tweet”. The Air Force spent a lot of time and money soundproofing buildings at bases where the T-37 was stationed, and ear protection remains mandatory for all personnel when near an operating aircraft. 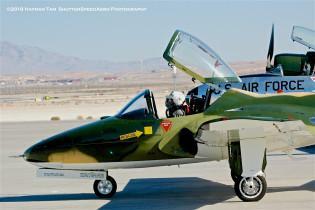 First flown in 1954, the T-37 served as the U.S. Air Force’s primary pilot training vehicle for over 55 years before retiring its last T-37 in 2009. Three other air forces still operate the aircraft. Nikon D70s w/70-300mm.